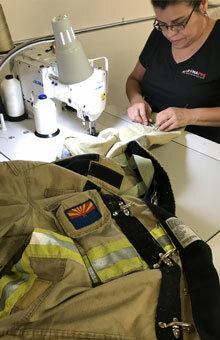 Personal Protective Equipment Repairs Service - Arizona PPE Recon, Inc.
All Repairs must be performed by the original manufacturer, a verified ISP who has received training, or a member of the organization who has received training, per the latest edition of NFPA 1851. All repairs and alterations to the ensemble or ensemble element shall be done using like materials and components as the manufacturer’s method of construction which are compliant with NFPA 1971, Standard on Protective Ensembles for Structural Fire Fighting and Proximity Fire Fighting. 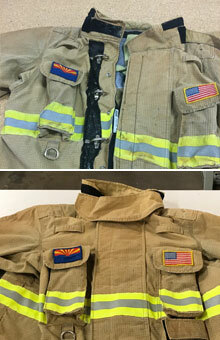 Arizona PPE is a third party verified ISP by Intertek, for performing advanced repairs on firefighting garments. 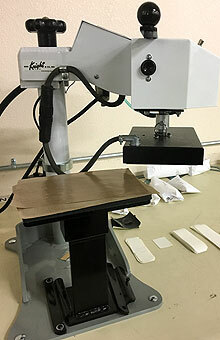 CALL US TODAY TO GET YOUR PPE REPAIRED!! Bring Your Gear Back to Original Spec! © 2019 Arizona PPE Recon -All Rights Reserved. Effective June 24th 2007, a revision to NFPA 1851 “Standard on Selection, Care, and Maintenance of Protective Ensembles for Structural and Proximity Fire Fighting” makes it a requirement for maintenance and repair organizations to be verified by a third-party certification organization.